Dennis Creffield, a British artist known for his series of cathedral drawings, was commissioned by James Hyman to produce a collection of works on the theme of 'Jerusalem', for exhibition at the James Hyman Gallery in 2007 CE. 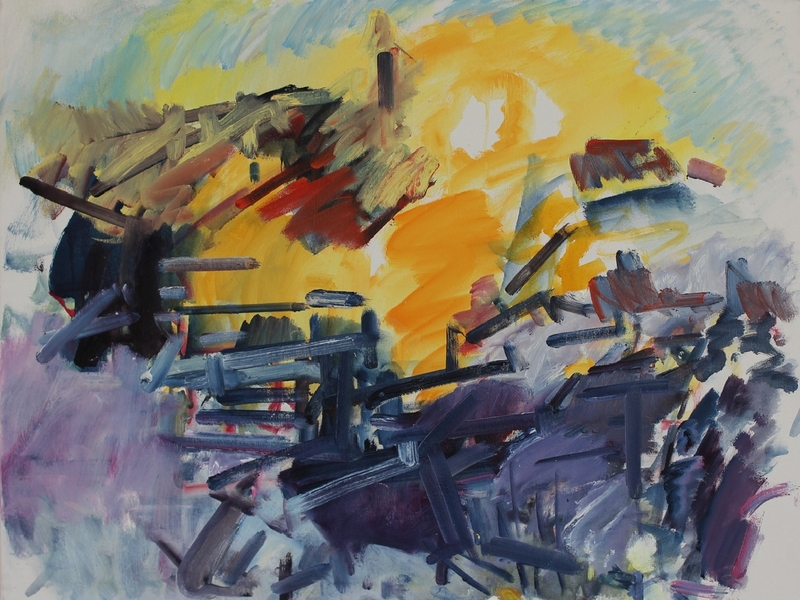 The works created for the exhibition built in part on a 1948 painting by Creffield, created during his time as a student of David Bomberg (1890–1957), as well as on works from an earlier exhibition in Jerusalem, also curated by James Hyman, which prompted Creffield to visit the city. The body of work Creffield developed for the 2007 show constituted a response to the famous city itself and a response to William Blake’s London/Jerusalem. In the process Creffield interwove the holy city of the imagination of Jews, Christians and Muslims with the imagined realm of Blake that is so deeply embedded in the history of British art. The collection, one of which is shown here, includes images of the city of Jerusalem, the city of London, and portraits of Blake. Running through these images was a recurrent image of a dome: the dome of Blake’s head, the Dome of the Rock in Jerusalem, and the Dome of St Paul’s in London. Paintings of Jerusalem landscapes from Creffield's early visits to the city in the 1990s were presented alongside more esoteric and symbolic visions from the 2000s, such as Jerusalem as a bride. The juxtaposition highlighted the multifarious significance of the city, as both a beautiful geographic reality as well as a symbolic ideal. Creffield’s works thus play with the idea of Jerusalem, consciously recognising and celebrating the city ‘as an actual place but also a part of… faith, imagination and dreams - dreams of the past and even hopes of the future’ (Creffield, Jerusalem catalogue).